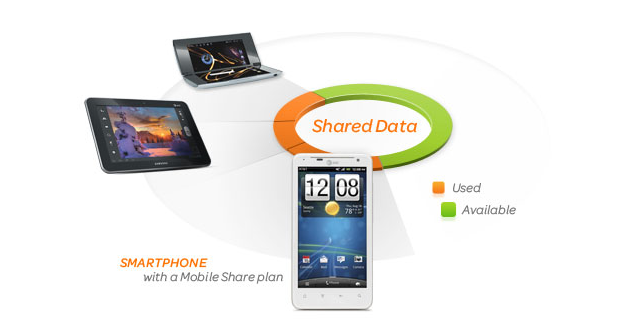 Today, AT&T unveiled its concept for a shared data plan. The surprise: it’s almost identical to Verizon’s new Share Everything plan. 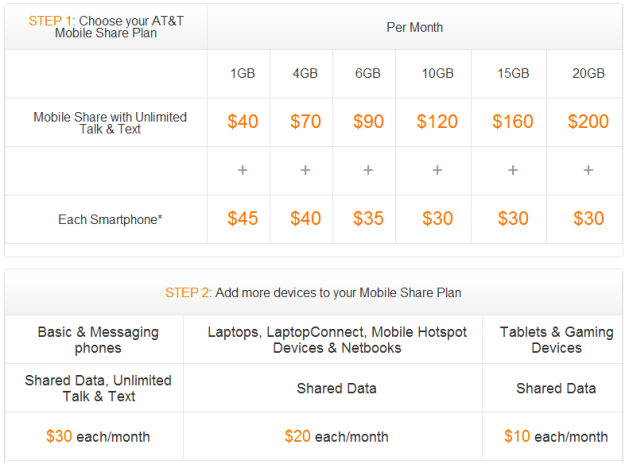 Instead of paying for minutes, texts, and a set amount of data, AT&T customers who choose the “Mobile Share” plan will pay for a set amount of data that can be shared with up to 10 devices and then also pay a steep monthly fee for any device they wish to connect to their plan. The fee structure is mostly similar to Verizon with smartphones costing about $45 per month and other devices costing less. Data starts at $40 for 1GB and goes up to $200 for 20GB. The chart below illustrates how it all works. Unlike Verizon, AT&T says it does not intend to force users to join its new plan — at least, for now. These new plans are merely an option for new users. Though it has hinted at shared data plans for some time, AT&T’s new plans seem reactive to Verizon. They appear to offer a slight discount for families over Verizon’s plans — but not much. In the coming days, we’ll examine this plan and directly compare it to Verizon’s to better understand who’s offering a better deal.